The location of villa Llentrisca could not be better! A choice of shops and restaurants are within a few minutes' walk. You can also reach the lively Calan Bosch Marina in around 20 minutes on foot. There is a small sandy bay by the marina and the main beach is around ½ mile further along the coast. This 3 bedroom, 2 bathroom villa is of a typical Menorcan style and includes WiFi and air conditioning/heating in the bedrooms and lounge. A perfect choice if you want a great location! The shops, bars and restaurants are around 5 minutes' walk from the villa! Outside, the covered terrace shades a table and chairs, and, coupled with the brick BBQ, creates the ideal space for an alfresco, Spanish tapas meal. The private swimming pool has Roman steps for easy access and the gardens are fully enclosed and bordered by hedging and palms. A traditional olive wood gate opens onto the villa grounds. There is parking space on the street for your car should you choose to hire one. The open plan living area has a high-beamed wooden ceiling, a seating area, flat screen TV and a table and chairs. Patio doors open onto the exterior dining area and pool terrace. An archway connects the living area to the fully equipped kitchen, which also has a door onto the gardens. 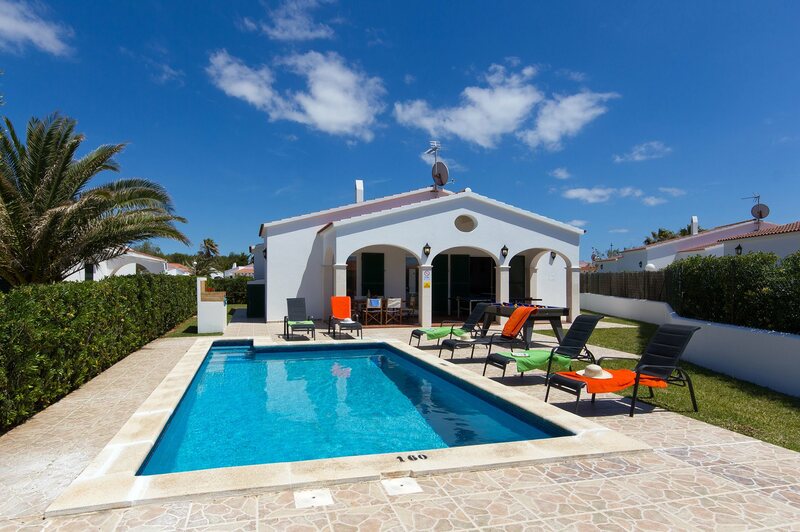 Villa Llentrisca has 1 double bedroom with an en suite bathroom and 2 twin bedrooms sharing a separate bathroom. The twin bedroom at the rear of the villa also has a door onto the pool terrace. Tourist Licence Registration: HT 175 ME. Villa Llentrisca is located in the sought after resort of Calan Bosch, in the residential area known as Cap D'Artrux. Life in this stylish resort revolves around its lively marina where there is a good selection of shops and restaurants. The marina is around 20 minutes' walk away where there is also a small bay. The main beautiful, sandy beach is only 5 minutes further. Villa Avellano is next door. The villa is only a few minutes' walk from a small selection of shops where you can buy daily essentials. However, you can reach the lively marina in around 20 minutes on foot for a much larger choice of shops and popular night market. Alternatively, for serious shoppers, venture into Ciutadella, around 6 miles north of Calan Bosch. Here you will find a lively market and a never-ending choice of chic shops and boutiques. The nearby commercial area has a couple of good restaurants. The marina has a much greater selection of bars and places to eat overlooking the yachts. If you want to sample the busy nightlife, then return to the harbour after dark to visit some of the most famous restaurants on the island and listen to live music. Calan Bosch's main beach is a little over a mile from the villa. A picturesque, sandy bay with clear, shallow water makes it a great choice for families. Calan Bosch is home to one of the islands 3 waterparks, Aqua Rock, located right by the marina. You can easily reach Ciutadella, which is just north of Calan Bosch, either by car, bus or taxi. Once the capital of the island, the town has a huge choice of shops and restaurants, some overlooking the harbour. The area also has some spectacular architecture. Alternatively, visit the highest point on the island, Monte Toro. There is a gift shop and cafe at the top where you can enjoy a bite to eat and admire the stunning 360° views over the island. Menorca's only golf course is around 50 minutes' drive away in the resort of Son Parc. The villa is only a few minutes' walk from the coastal road, which has fantastic panoramic views of the Mediterranean. Definitely worth venturing out for an evening stroll! Alternatively, visit the neighbouring resort of Son Xoriguer, which has all kinds of water sports facilities. Windsurfing, water skiing, scuba diving and sailing are all popular here. Every villa comes with its own manual, complete with details of the best restaurants, taxis, local amenities and activities. In addition, of course, our reps are on hand to make sure you love your holiday more. If you need any advice or tips on the local area, they will be more than happy to help. Villa Llentrisca is not available to book for season as it is sold out. Take a look here at the Menorca villas that are currently on sale. Lovely villa, spacious and well equipped. Pool and outside area were great. Everything was first class - from the initial booking through to arriving at villa. 2nd time of staying at this villa, which has everything you need. Very well equipped & spacious; it was very comfortable. Good security with all exterior lights well placed and the addition of the house alarm was reassuring. Lots of information contained in the Villa Plus folder left in the villa on how to operate the kitchen equipment, TV etc. The luxury of having your own pool was brilliant: it was a well laid out area, a real sun-trap, with good sun beds, al fresco eating area, table tennis table & pool table: all well used! Would definitely recommend the villa. We didn't need the services of the Rep Julie, but she popped round a day after our arrival for a courtesy visit, which was very thoughtful.